The Russell 2000 Index is a small-cap stock market index of the bottom 2,000 stocks in the Russell 3000 Index. It was started by the Frank Russell Company in 1984. The index is maintained by FTSE Russell, a subsidiary of the London Stock Exchange Group. The Russell 2000 is by far the most common benchmark for mutual funds that identify themselves as "small-cap", while the S&P 500 index is used primarily for large capitalization stocks. It is the most widely quoted measure of the overall performance of the small-cap to mid-cap company shares. The index represents approximately 8% of the total market capitalization of the Russell 3000 Index. As of 28 February 2019[update], the weighted average market capitalization for a company in the index is around $2.43 billion; the median market cap is $818 million. The market cap of the largest company in the index is $8.65 billion. It first traded above the 1,000 level on May 20, 2013. Many fund companies offer mutual funds and exchange-traded funds (ETFs) that attempt to replicate the performance of the Russell 2000. Their results will be affected by stock selection, trading expenses, and market impact of reacting to changes in the constituent companies of the index. Note that it is not possible to invest directly in an index. 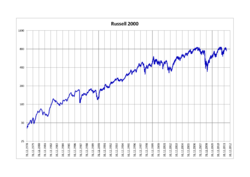 ^ "Russell 2000® Index Factsheet". ftse.com. February 28, 2019. Retrieved March 30, 2019.